Ready to ship in two to three weeks, our beautiful Chesapeaka Five Drawer Chest is handcrafted in a mix of classic Brown Maple, and luxurious Tiger Maple that will add depth to the storage decor in any suite. Bench-built with a timeless Shaker style and mixed with a touch of modern sophistication, this chest is versatile enough to complement any bedroom. As an extension of your bedroom furniture suite, this chest features five spacious drawers which are dovetailed and mounted with a high-quality, ball-bearing glides that incorporate a full-extension mechanism that ensures you have complete access to any of your items stored inside. In front, the gorgeous grain patterns in the Tiger Maple are brought to life by a stain of your choice and finished with an inset recessed hardware that adds the perfect touch to the finished piece. 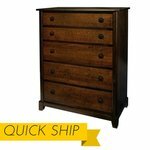 Choose from four different stain options for this piece and your new chest will be ready in no-time. The end result is a piece that is sure to offer a lifetime of service and provide the perfect hand-me-down for future generations to cherish. Questions? Please give us a call to answer any questions on our Quick Ship Chesapeaka Collection. Each piece is available in four pre-selected stain options, but you can also customize the stains to fit your space at no additional charge. Let us know what's perfect for you and we will help you furnish the bedroom you've always wanted.